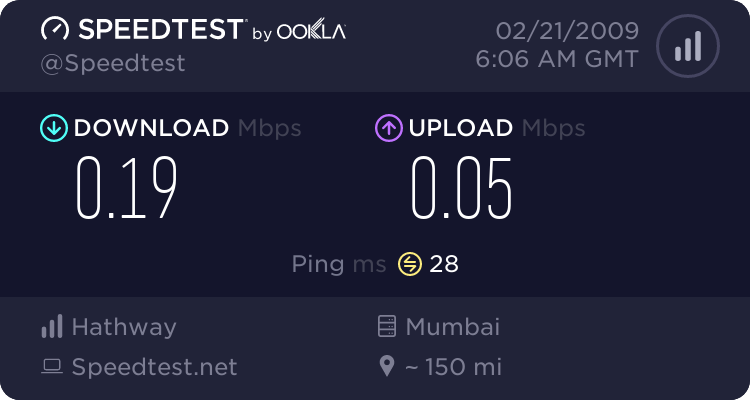 since last two days - suddenly - i have been facing internet connection problems. download speed has gone down a little. am unable to download a file - downloading stops midway, as if the connection has gone to sleep. May have too much spyware on hard drive. Do a disk cleanup, under system tools. Also go to Windows Internet Explorer > Tools > Internet Options and Delete, cookies, files, history. Then scan disk and reboot. sorry i didnot mention that i have done all that you have suggested. cleaned the cache/temp files, cookies etc. sweeped the sys thru spywareblaster, spybot, malwarebyte's AM. that is - all said i am clean! ...and what browser, version? Did you try another browser? i am connected to my local ISP through a cable - physically (thru a router switch?) however it may not be a cable connection in the terms used technically, it may be a modem connection. i have mozilla ff installed (vers. 1.8.20060.50817), but i rarely use it. though i checked with it too and the connection there also seemed slow, and downloads stalled. 2. Go Start>Run ("Start search" in Vista). Double click on ping.txt to open it in Notepad. Copy all text, and post it in your next reply. 4. What happens, if you bypass the router, and connect straight to the modem? i deeply appreciate you for the help you are giving me. re: ff 3, i read a few negative reviews on net about it (it causing problems) so i was afraid to download it and replace my older vers. hope this gives u enough info.... if not, obviously u can ask me to provide it. Speed test results are simply ridiculous, if we're talking about cable connection here. I'd be curious to know what is your ISP advertised speed. In any case, it looks like there is something wrong on your ISP side, since ping results look normal, but speed test results don't.